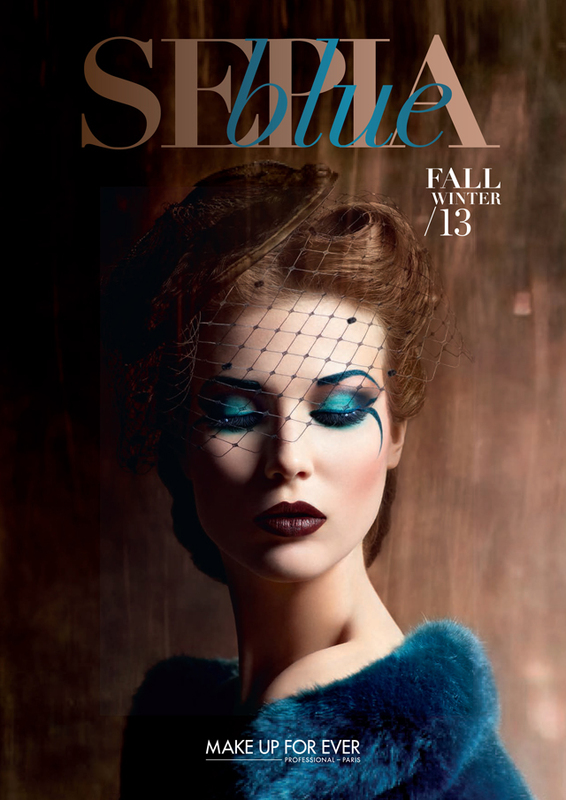 Dany Sanz (MUFE Creator and Artistic Director)’s chosen color for Fall/Winter 2013 is a deep, intense and luminous peacock blue and its awe-inspiring tone puts the finishing touch on this elegantly sophisticated collection, embraced by stunning sepia tones: copper fawn, coffee, light pink, espresso, and metallic taupe. The season’s star palette highlights color right from the start; its streamlined design features stylized, graphical and ultra-feminine typography. It spotlights the masterful combination of Petrol Blue, this season’s new black, with sepia tones. With 5 vibrant shades of brown, 1 shimmering pink and 1 basic black, the palette paints a perfect picture with the electrifying Petrol Blue at center- stage. Offering an ideal range of textures and effects to create any make-up look, from simple to sophisticated or extremely artistic, with 1 satiny, 2 iridescent (Light Pink and Petrol Blue) and 5 matte shades of eye shadows, all the eye shadows have a silky texture that allows for quick, easy application. 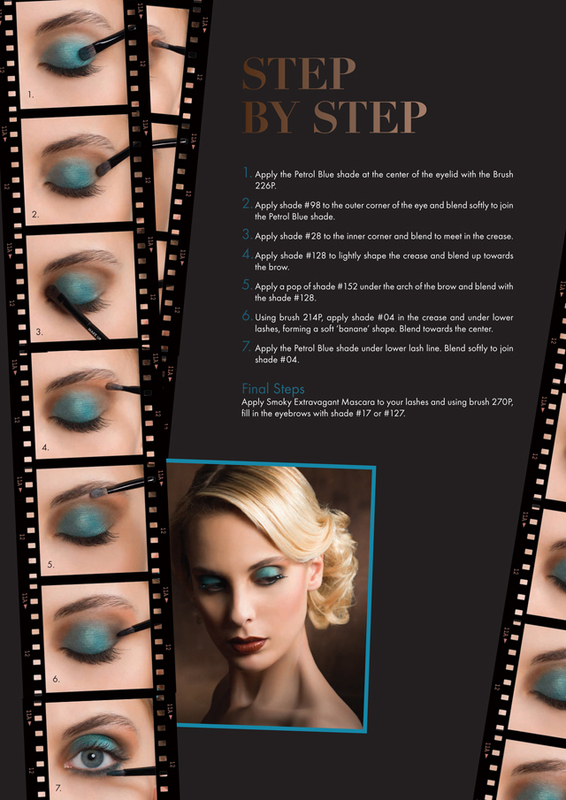 The Blue Sepia palette offers a unique professional touch: 2 of the eye shadow colors can double up as eyebrow make-up. In addition, 2 new-fiber brushes complete this essential eye color kit that is suitable for both make-up professional and urban women to use. The 2-sided brush is applying eye make-up with precision and creating a variety of effects while the other brush is specially designed to help enhance the brows. A well mixture of colors! or add the black for a smokey look! The two colors that can be used for your brows are Espresso(17) and Metallic Taupe(127). Btw, I feel they can be used to contour your nose too! Cause they are matte brown/taupe colors! So... this palette can be used for your eyes, nose and contouring! One palette, three uses. Useful right? Will definitely make this my travel palette! Plus the palette is really small in size, only 11.9 x 5.0 x 1.0 cm, very compact, good for travel. :: These eyeshadows won't flake at all and are really smooth and easy to apply. :: Highly pigmented colors. Most only required one swipe (except for #152 and #127). :: Colors are really long lasting! Had to use makeup remover to completely remove them. :: Three awesome brushes in one palette (two for eyes, one for brows). Here is one of the make up look that can be found on the back of the palette. Since MUFE is a Paris brand, their makeup looks can be quite different from Asian looks. So... I will be doing an eye tutorial using this palette sometime later. I'm not a fan of using so much bright colors for my eyes. Do keep a lookout for that post!